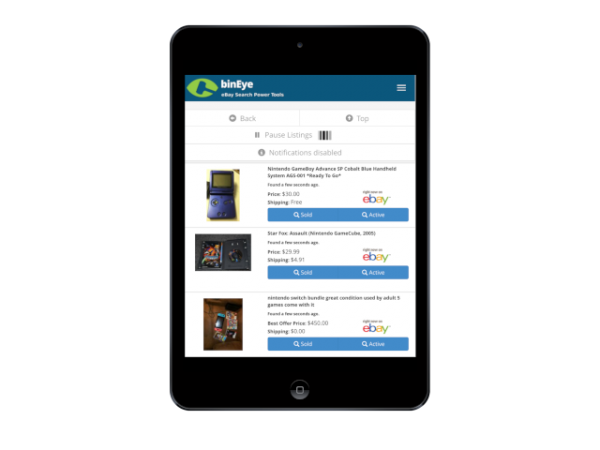 Our Buy-It-Now Catcher gives you a live-action view of newly listed items on eBay. Enjoy a unique perspective of the eBay marketplace, discover more items and never miss the best bargains. See the newest eBay listings appear in front of your eyes in real time – no need to refresh the page! Watch a whole category at once. For more specific searches, turn on notifications to be alerted to their appearance. Check the value of a listing against others in a single click. You can check both sold and active listings. See what an item has sold for and what other sellers are asking for the item right now. All platforms, all devices. No software installations. Log in from a desktop or laptop for the best view. Log in from a tablet or phone to keep searching on the go. 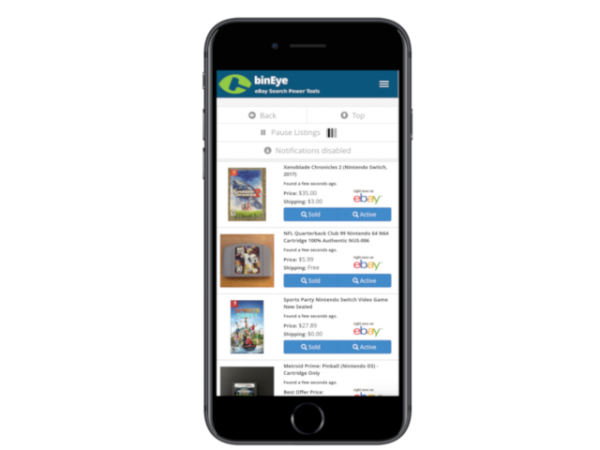 binEye shows you new Buy-It-Now listings as they appear on eBay search. Just watch! Get on with your day while binEye watches for buying opportunities. One click title searches for both sold and active listings help you determine the value of the item in a flash. binEye Buy-It-Now Catcher is compatible with PCs, tablets and phones. So you can keep up with eBay purchasing while away from your desk, or on the go. … not listing start time. It can often take a while for new items to show up on eBay’s search results, so our ordering catches many more items. The Buy-It-Now Catcher keeps and presents a list of your most recent searches, so you can access your most frequently used search parameters in one click.